Summary: Using non-invasive brain stimulation, researchers stimulated the lateral prefrontal cortex and medial prefrontal cortex, enhancing executive function and self control. “These are maybe the two most fundamental brain areas involved with executive function and self-control,” says Reinhart, who used a new technique called high-definition transcranial alternating current stimulation (HD-tACS) to stimulate these two regions with electrodes placed on a participant’s scalp. Using this new technology, he found that improving the synchronization of brain waves, or oscillations, between these two regions enhanced their communication with each other, allowing participants to perform better on laboratory tasks related to learning and self-control. Conversely, de-synchronizing or disrupting the timing of the brain waves in these regions impaired participants’ ability to learn and control their behavior, an effect that Reinhart could quickly fix by changing how he delivered the electrical stimulation. The work, published October 9, 2017, in the journal Proceedings of the National Academy of Sciences (PNAS), suggests that electrical stimulation can quickly–and reversibly–increase or decrease executive function in healthy people and change their behavior. These findings may someday lead to tools that can enhance normal brain function, possibly helping treat disorders from anxiety to autism. Reinhart tested each of the 30 participants three times, once up-regulating the oscillations, once disrupting them, and once doing nothing. In tests where Reinhart cranked up the synchrony between the two brain regions, people learned faster, made fewer errors, and–when they did make an error–adjusted their performance more accurately. And, when he instead disrupted the oscillations and decreased the synchrony–in a very rough sense, flicking the switch from “smart” to “dumb”–subjects made more errors and learned slower. The effects were so subtle that the people themselves did not notice any improvement or impairment in the task, but the results were statistically significant. Then came the most intriguing part of the study. Thirty more participants came in and tried the task. First, Reinhart temporarily disrupted each subject’s brain activity, watching as their brain waves de-synchronized and their performance on the task declined. But this time, in the middle of the task, Reinhart switched the timing of the stimulation–again, turning the knob from “dumb” to “smart.” Participants recovered their original levels of brain synchrony and learning behavior within minutes. 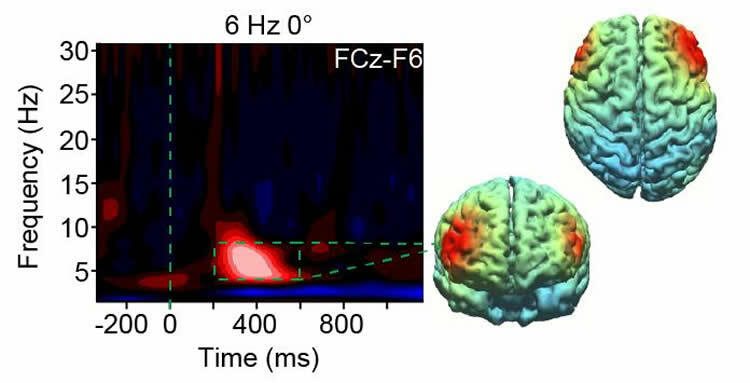 The large red blob (left) indicates an increase in the timing, or synchronization, between brain waves measured over the medial frontal cortex and right lateral prefrontal cortex. This enhanced timing across brain regions specifically occurred at low frequencies, right after participants viewed negative feedback. This increase in synchronization corresponded with improvement in behavior related to learning and self-control. NeuroscienceNews.com image is credited to Robert Reinhart. Though Reinhart cautions that these results are very preliminary, he notes that many psychiatric and neurological disorders–including anxiety, Parkinson’s, autism, schizophrenia, ADHD, and Alzheimer’s–demonstrate disrupted oscillations. Currently, most of these disorders are treated with drugs that act on receptors throughout the brain. “Drugs are really messy,” says Reinhart. “They often affect very large regions of brain.” He imagines, instead, a future with precisely targeted brain stimulation that acts only on one critical node of a brain network, “like a finer scalpel.” Reinhart’s next line of research will test the technology on people with anxiety disorders. Funding: This study is a result of a collaboration between IDOR, UFRJ, UFRN and UNICAMP, and was funded by the following Brazilian funding agencies: National Council for Scientific and Technological Development (CNPq), Research Support Foundation of the State of Rio de Janeiro (FAPERJ), Coordination for the Improvement of Higher Education Personnel (CAPES), Funding Authority for Studies and Projects (FINEP), Brazilian Development Bank (BNDES) and São Paulo Research Foundation (FAPESP). Image Source: NeuroscienceNews.com image is credited to Robert Reinhart. Boston University. “A Turbo Charge For Your Brain?.” NeuroscienceNews. NeuroscienceNews, 9 October 2017. Boston University. “A Turbo Charge For Your Brain?.” http://neurosciencenews.com/brain-oscillations-executive-function-7694/ (accessed October 9, 2017).